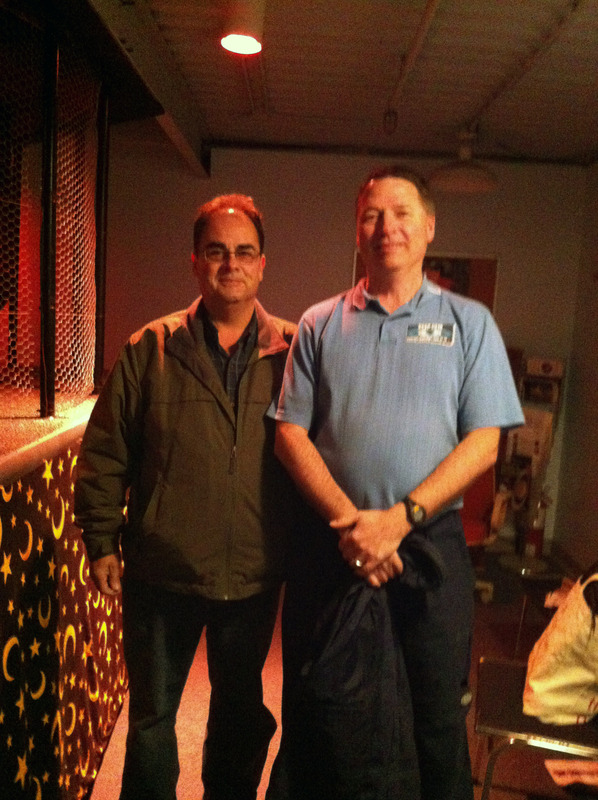 In planning to capture some images around the time of opposition, Alden and Ron met me at the Science Centre on Monday [April 9th]. Alden brought the C8, and Ron brought the keys! Alden and Ron, happy in the dome! Great mentors! As it turns out, the seeing has been pretty lousy lately, and the forecast for this weekend is pretty terrible; there is little chance the skies will clear on the eve of opposition, tomorrow: April 15th. [Well, today: it snowed today, and it’s totally overcast]. My plan for Monday was to set up the C8 on the rooftop and try to learn to collimate [align the lens elements of] this Schmidt-Cassegrain, and to test my D7000 and Solar System Imager IV on both it and the LX200 housed within the Kallium Observtory dome. Ron and I arrived first, though he suggested I go get warmer boots since the forecast was for cold. When I returned Ron and Alden had already hauled the C8 up those stairs, and I was well outfitted: Sorel’s, toque, snow pants [which I didn’t need in the end]; both cameras, two telescopes, mounting accessories, a bunch of lenses, and junk food. 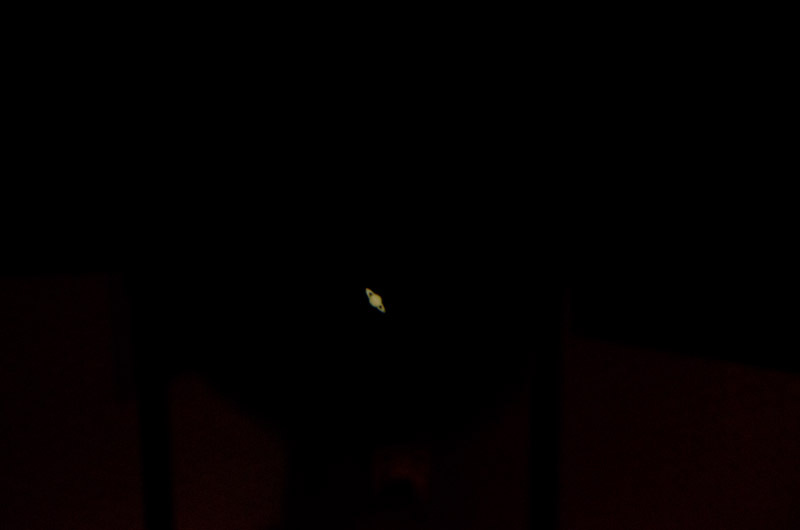 We set up the C8, opened the dome, synched the LX200 to Venus and set it to track, and we spent some time trying to focus the C8 on something; anything. Shane had agreed to assist me with collimation [thank you for the coffee, Shane]. I understand the concept, but didn’t want to break the darned thing. We had 3 sets of allan keys and I was surprised by how tiny the screw size is. We worked out a system: I centered the chosen star, described the position of the shadow of the secondary mirror [up/down/left/right]. I removed my eye from the eyepiece, Shane used a flashlight to insert the allan key and made an adjustment, removed the key and got his hand out of the way; I re-centred the star and described the new position of the shadow, and so on and so forth. We came very close, at one point, to a near-perfect centering of the shadow, and probably should have left it at that. The allan key was attached to a set, which was too heavy to leave inside the screw after each adjustment: so, get single screws, or use Bob’s knobs. After more than an hour, maybe, of fooling around, Chris and Mike showed up to say hullo. Shane and I had already noticed some evidence of moisture damage on the inside of the lens [reminding me of all those moldy lenses I saw during the time I worked at Henry’s camera store]. By then, there’d been plenty of time for the C8 to come to ambient temperature, yet we still couldn’t resolve a decent focus, even accounting for viewing conditions [I think]. I think at some point Chris wondered what the Craigslist for-sale subject header might be! 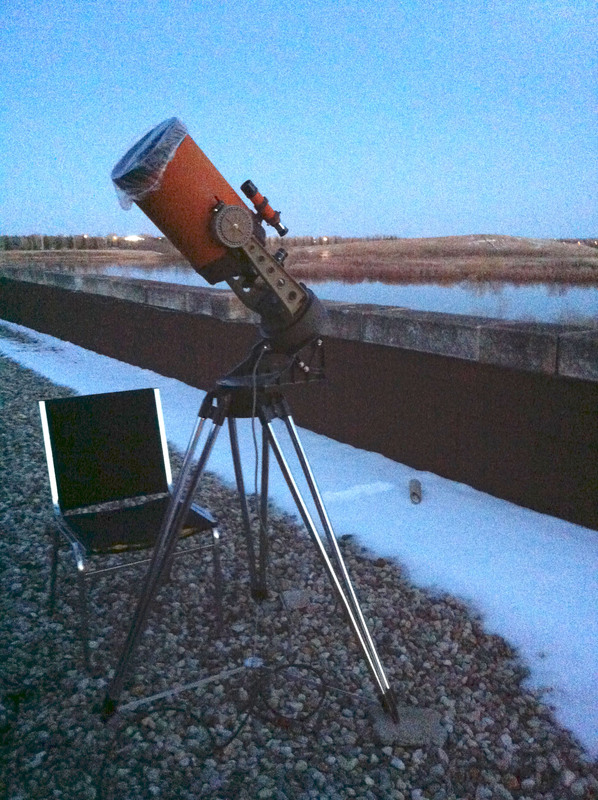 The Regina Centre Celestron 8″ set up in general relation to Polaris, on the rooftop of the Science Centre, just outside the dome. By then, it was just Chris, Mike, and I, and I managed to disassemble and re-pack the C8 on my own [well, Mike had some fun with that monster tripod all on his own], and turned our attention to the LX200. 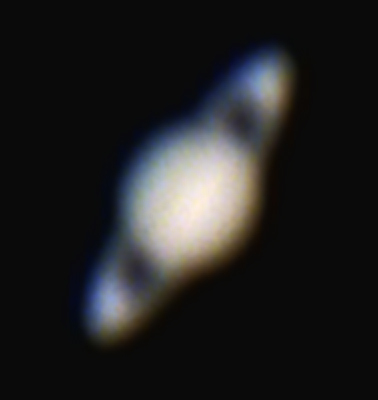 It was close to 10:30pm, so Saturn was a bit higher in the sky [about 20˚ above the horizon]. Earlier, Ron, Alden and I had some trouble resolving an image even after the dome had been open for over an hour; closing the door to the main hallway fixed that, since it was sending warm breeze to swirl around the room. At this point, the main challenge was achieving focus given the drawbacks of the location of the telescope. Firstly, it’s mounted to the floor/building in a way that does not reduce shake [according to Ron and Chris and everyone], and perhaps amplifies it. Secondly, Regina is windy, and the building shakes in the wind. Thirdly, every vehicle that drives by sends waves through the earth and the building. Fourthly, any human movement in the dome, including breathing and speaking, cause shake. So I connected the CCD and Shane, Mike and I looked at my macbookpro screen for a while. Eventually I hinted for solitude and they cheerfully took off. 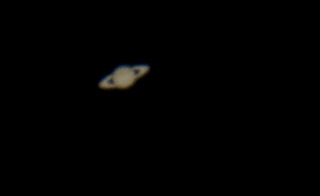 Saturn blows my mind. 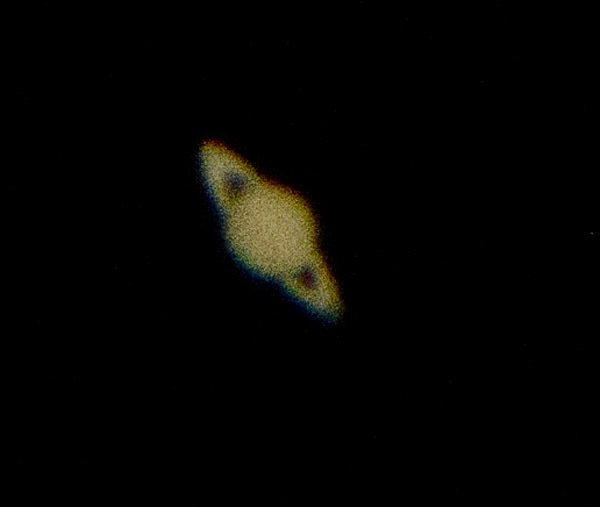 Using the eyepiece and my eye with a couple of lenses [they HYP zoom and a 24mm I think – I need to take better notes], I was able to clearly focus on the planet and it was stunning. 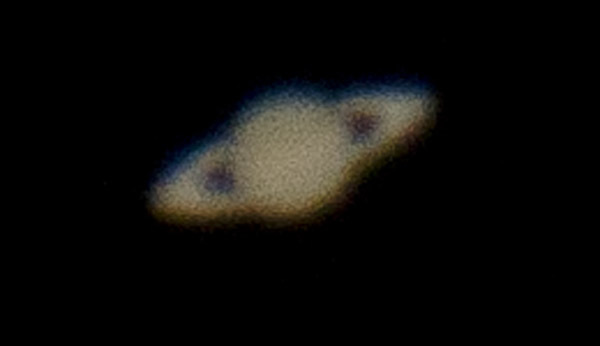 I could see a bunch of moons [SkySafari says: Titan, Hyperion, Rhea, Mimas, Dion, Tethys, Enceladus, Iapetus, not sure if I saw all of these, but this cluster seems to be as much as I recall]. I wished I had more stamina to just stand there and peer, or better gear to use my monitor to see with such clarity. 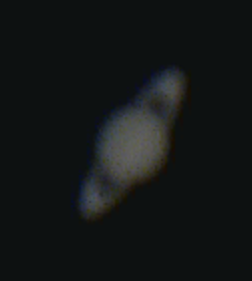 Saturn is stunning. I did a bunch of CCD tests experimenting with the gain controls, and with the frame rate when I finally figured out how to control it. Click HERE to go to the images below. 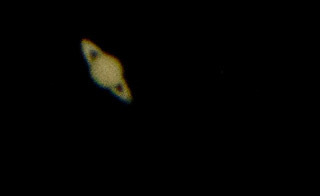 I then attached the D7000 to the star diagonal with Peter’s HYP24mm, and prime [having removed the star diagonal], and also did some hand-held projections. Click HERE to go to the images below. So, by now, I’ve collected images on two night during 2012 and I’m uncertain if I’ll have time to capture more here in Regina before I need to head to Toronto for the summer to finish up the phd. Maybe the night before my departure, on Astronomy Day. I hope in September I’ll make it to Grasslands with Chris and Mike, and maybe in Toronto I’ll connect with Rob and Dan, with the local clubs, the fella from Efston at the Petrie observatory, and whatever else I can muster. Well, I filled in this entire section, hit the publish button, and got timed out and lost everything. I should know by now to select and copy all before making such moves. Here I go again. I shot 20 short video clips with the SSIIV, experimenting with gain and exposure, and then found the frame rate controls; I selected two clips for testing and including in this blog post. deconvulution radius 2.00, threshhold 0.61. Double Size; deconvulution radius 3.00, threshhold 0.82. Double Size; deconvulution radius 3.30, threshhold 0.88. Cool, huh? Though a bit too stylized, I think. 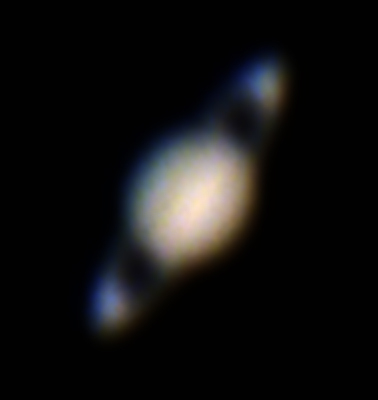 I tend to shoot at the highest resolution possible while trying to keep the ISO as low as I can. I also shoot raw NEF files along with low res jpeg files. Looking at the jpegs files, the images collected below looked like complete failures for the rejection pile. But, opening the raw files and doing some manipulations pulled out some detail. Top left ISO 400, top middle and right ISO 250; the rest were ISO 1600. I did some general uncontrolled testing of manipulation through the photoshop raw editor: changing exposure through +1 to +4; reducing blacks to 1 or 2; adjusting brightness/contrast, clarity/vibrance; playing with sharpening and noise reduction [luminance can soften the edges]. These are selections from images that have 4928×3264 pixels. 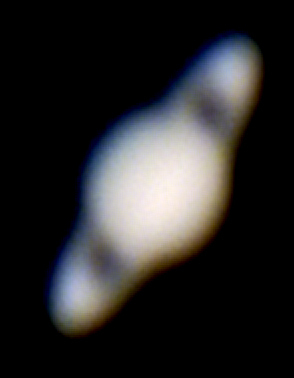 The largest area is actually the bottom right, from a hand-held shot: 261×331 pixels. 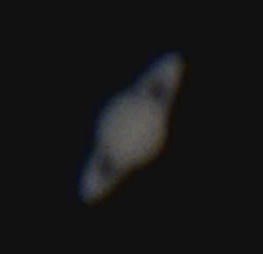 The smallest is from the middle, 104×138 pixels, I think this one is also from hand-held. I have a lot to learn about how to control these settings for various results, and a great range of manipulation is possible. This gives me a preliminary idea that what might otherwise not appear salvageable has potential. 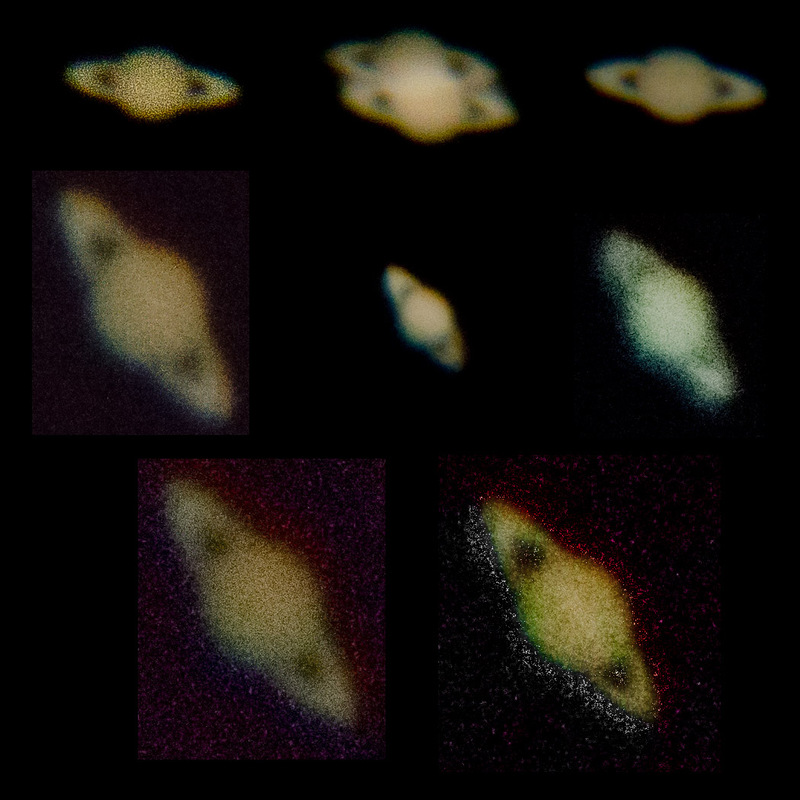 collection of near-rejects from D7000, combination of prime, with hyperion 24mm projection, and hand-held projection. You’ll be teaching the club soon enough Risa. Definitely can see you are doing great on a steep learning curve.